Team Smiley and the Cookie Cruiser have officially kicked off the season of smiles! On June 6, we attended our first BIG event of the summer: the Carnegie Library Summer Reading Extravaganza. The Extravaganza is a fun event that encourages summer reading and helps the library deliver learning opportunities to people throughout Pittsburgh all year round. Everyone had a blast! Kids and adults alike got creative and decorated almost 1,000 Smiley Cookies! Our team distributed an additional 3,000 Smiley cookies to guests all day long. Now THAT'S a lot of smiles! Smiley himself stopped by, and he made lots of new friends! He gave out plenty of hugs and had a great time dancing to the band that played tropical music for the large crowd of kids and their families. Smiley had some pretty impressive dance moves...who knew he was such a talented cookie?? Smiley also posed for lots of pictures - he LOVES being in photos! We would love for you to come visit us at some of our other upcoming events this summer, so check out our schedule at http://www.findsmiley.com/. In honor of Father's Day this Sunday, we wanted to share some special memories that our guests have made with their dads at Eat'n Park. Enjoy, and Happy Father's Day! My Eat’n Park experience took place with my dad. We would visit the restaurant to grab a lunch or dinner and desert of course. When we walked into the place, his thoughts of the past ran wild. His voice would change to that of his younger days, when he would go cruising in his or his buddies’ old hot rods or classic cars. I loved it!!! He went on to tell about how they would meet here and grab a shake, talk, and move on. They would leave Eat’n Park with nothing but smoke in their eyes and sweet memories. My dad now lives in York, PA and I maybe see him once or twice a year, but when he visits, we still like to stop in for meal, shake, and talk. In 1994, I became a single dad with three sons ages 12, 11, and 9. It was a struggle to raise them and work full time, but thanks to Eat'n Park's Saturday and Sunday breakfast and brunch buffets, we were able to spend a lot of quality time together eating quality food at a great price close to home. We would go there pretty much every Sunday after church and no one ever went home hungry. The food was always great and even though it was sometimes very busy, the service was always good and it was always worth it. Thanks for making my job a little easier! I first went to Eat’n Park in Monongahela as a little girl with my dad and his friend. I really enjoyed the atmosphere and the food, but what really got me was when I noticed the Smiley Cookies. They made me feel happy, and they brightened up my day. I also enjoyed being with my dad and spending time with him. 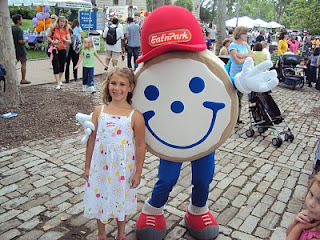 I now go to another Eat’n Park with my honey, and I still enjoy that same feeling and I still love the Smiley Cookies. Keep up the good work and the Smiley Cookies. Every Wednesday is a night-out with my Dad. Since my Mom passed away, my Dad and I meet every Wednesday for a movie, dinner and shopping. Our favorite movies are the ones with special effects and 3D! Our favorite place to eat is Eat'n Park by the river at the Waterfront in Homestead. We love to eat on the outdoor patio. It's beautiful. The foods we love the most are the club sandwiches, shredded beef, and the Nantucket cod, also breakfast for dinner is the best!!!!!! My Aunt joined us on Wednesday's when she lost her husband 5 years ago. We meet every Wednesday and I look so forward to it! I can't wait for THIS Wednesday and Eat'n Park! One day at Eat’n Park, me and my Dad were ordering our meals. When our waitress left, we noticed that she had duct tape on her shirt. My dad and I always go to the Duct Tape Festival in Avon every year. We had just come back from it. I had a whole bunch of rolls of duct tape. My dad and I made a duct ape purse right there while we were waiting for our meals. Everyone came around our table when we were finished and asked me and my dad how we did it. We both said “It's just natural talent!" That was my memory and it was awesome! We made it a family affair to go to breakfast at Eat'n Park before we all went bowling. This one particular time, we all got out of the car at the restaurant and it wasn't until we were all getting ready to sit down when my Dad looked at my Mother and said "you brought your bowling ball inside with you." We had a great laugh together. Almost fifty years ago, while my Dad was stationed in Philadelphia, we made the trip from Level Green to Monroeville twice a month to celebrate his coming home for the weekend. We would pull into Eat’n Park on Rte 22, and you could smell the burgers as you rolled down you windows. There were still waitresses that took your order from the car then; my order, as always, was a burger and chocolate milk! I can still look back and remember that smell, wafting from the kitchen. And I can see in my heart's eye my Mom and Dad (both gone on now) and my little sister, madly waiting to share the really cool French fries they had there! Now and again as I sit down with my GRANDchildren at “our Eat’n Park" in Monaca, and I can smell that aroma, and realize we are making memories for Ava, Ben, Dru And Ty that will carry them through the next fifty years. Thank you for still being our memory maker. During my high school years back in the mid-70's I played in the marching band. My father was the band director. Every Friday during football season we would visit the Eat’n Park in Jeannette after the game ended. The routine was such that my younger siblings (a brother and a sister) and I sat in the back of our Caprice Classic while my parents were in the front seat. It was customary to enjoy "curb service." The waitress would deliver a most delicious double decker hamburger, fries and a Coke to all of us on a tray that would hook over my father's driver side window. This is one tradition that I have not been able to pass down to my own daughters since the custom of curb service has fallen by the wayside; however, my memories of this are most fond.